Hey guys! Today I have a new-to-me brand to share. 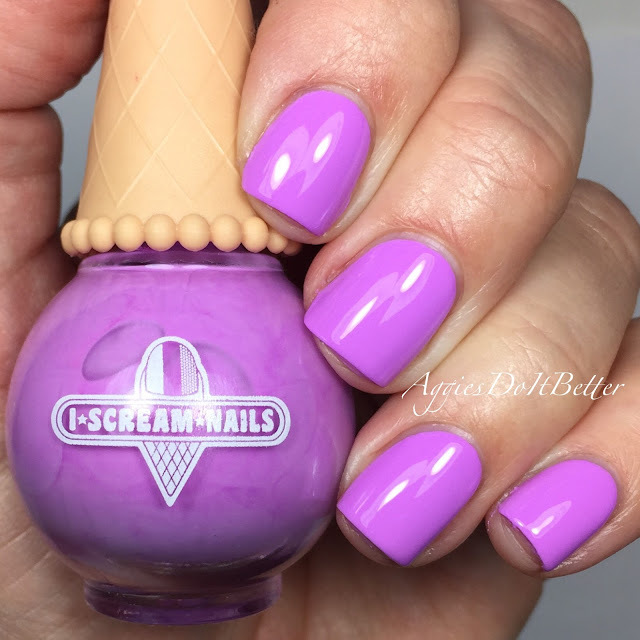 I Scream Nails is an Australian brand exclusive to their salons in Melbourne and Sydney. They do offer their polishes online, but they don't ship outside of Australia! (Well, they do ship PR stuff, but I'm not in on that!) I'm lucky enough to have a polish-minded mother in law who graciously agreed to go to the shop in Melbourne for me and send these over! Yippee! They do offer more colors than this, but they are pretty expensive (I think) for a smallish size so I kept my request at 6. For the most part, all of these swatches are 2 coats on all, and have pretty good formula. I used topcoat in all swatches. Blue Heaven is a light almost periwinkle blue. I purposely swatched it first so I would be forced to take it off-see, I'm trying! Soft Serve (appropriate name!) is a bright white creme. It was really iffy and tricky on first coat but nice on second! Liquorice Twist is a really amazing black creme! This was ALMOST a one coater. Grasshopper Pie is a bright mint creme. I had to use a light hand with this one. It also had some strange dark bits in it, I'm guessing maybe from the pigment not being all the way mixed up? You can't really see them in this pic. 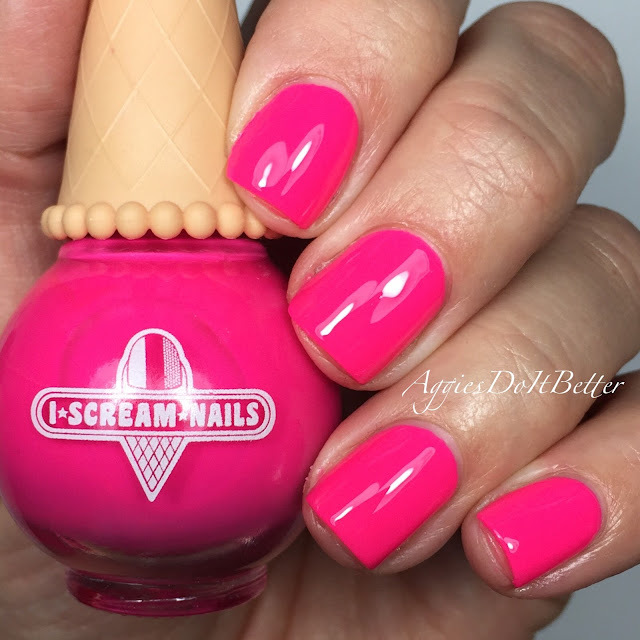 Bubblegum Bang is an almost neon pink. Therefore, this pic isn't that color accurate because we all know neons don't behave for pictures! It's very pretty and BRIGHT! Grape Soda is a purple creme. This reminds me a lot of Essie Playdate. Okay, final thoughts. Can we just TALK about how cute these bottles are?! I'm definitely a person who loves packaging and these are a 10 out of 10 in that department! They are going straight up on my display rack. That being said, the brush is nice but small, and the odd shaped and slick handle made it a little hard to hold at times. The formula is good, not awesome but pretty good. They are a little overpriced at $14.95 Australian dollars (which is a little over $10 US dollars) for 10ml. And they don't even ship here! They should right! I'm pretty happy with these and can't wait to try more. 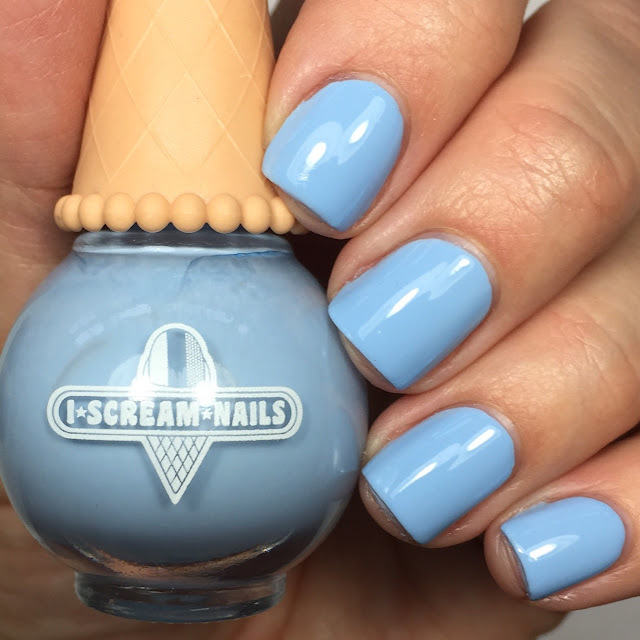 Hmmm...If I am going to spend more than $10 on a creme polish, it had better have a fantastic formula. 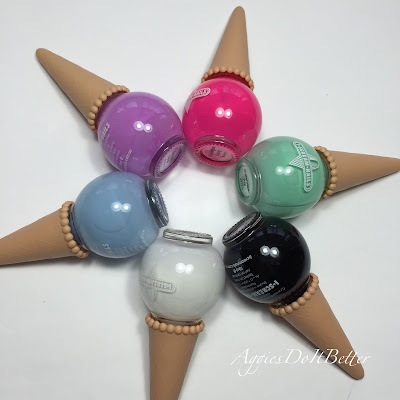 The colors are very nice though and your swatches are great!